Tuesday, August 14th, 2018, 5:30 p.m.
A trip to the Mediterranean - who wouldn't be thrilled? 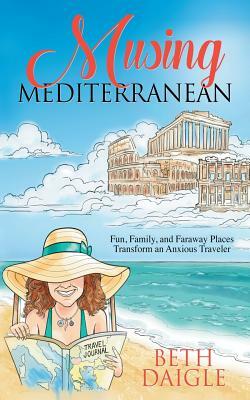 Beth Daigle presents her memoir of anxious adventure, Musing Mediterranean: Fun, Family, and Faraway Places Transform an Anxious Traveler. Beth Daigle should be doing back flips as she prepares to escape her humdrum suburban life, but travel anxiety gets the best of her. This is a trip of a lifetime, something to look forward to, yet Beth is dreading it. About the author: Beth Daigle is a writer, blogger and author with a passion for story-telling. Her desire to travel is squashed only by her fear of it. Not to mention her unabashed homebody tendencies. At home, Beth enjoys her role as wife, and mom to two daughters plus one very sweet Schnauzer. She is happy doing anything artsy, but favors writing as her foremost creative outlet. For Beth, family and laughter are everything.